time: start – 8:15 a.m. ; finish – 1:00 p.m.
weather: Overcast and cloudy in the a.m. with the sun appearing in the mid-p.m.; still a warm day! campsite: CRCS07 “urban renewal project”: A site well away from put-in beside the portage trail right side. The ground was covered with some grass and other debris and growth – with only some sand!! Flat with room for our 4-person tent. An early-ish start this day – 8:15. 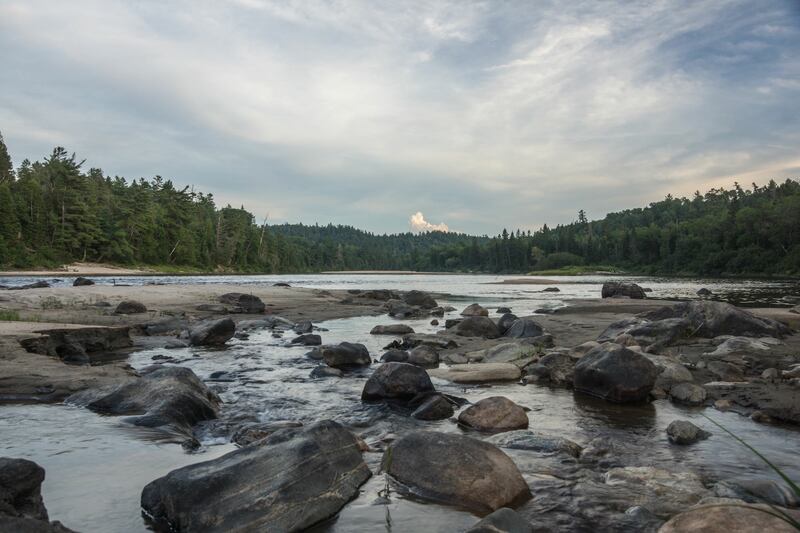 We left our parking lot campsite behind, determined that the rest of our campsites would be more like the ones we liked – a sheltered spot on a rock outcrop with a scenic view of the river and some distance from a road. We’d hit two out of three over the next few days. This day would be one of the “hits”! The only thing that’s left of the bridge is the pillar in the middle of the river. 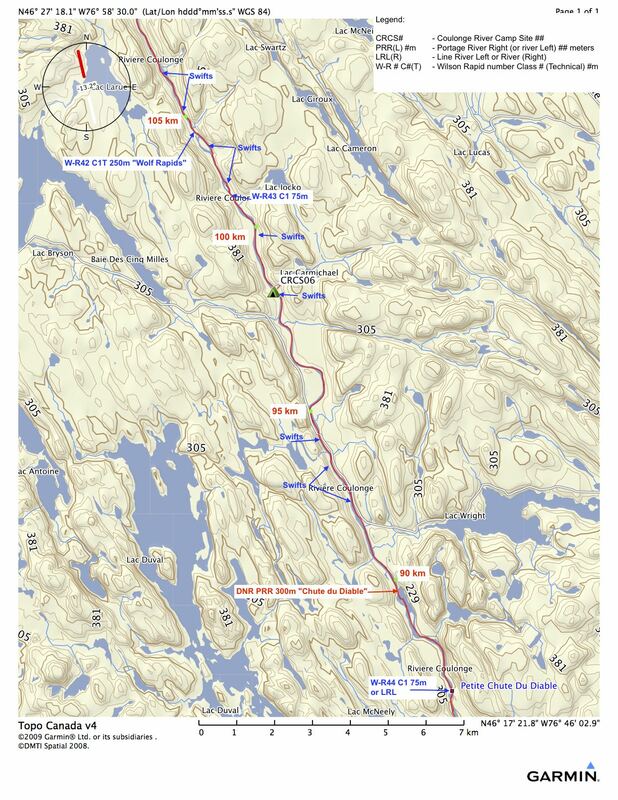 Wilson’s comments date back a quarter-century, long enough for the road also to have been abandoned. We did not go up to see if there were any visible remains of the lumber camp. 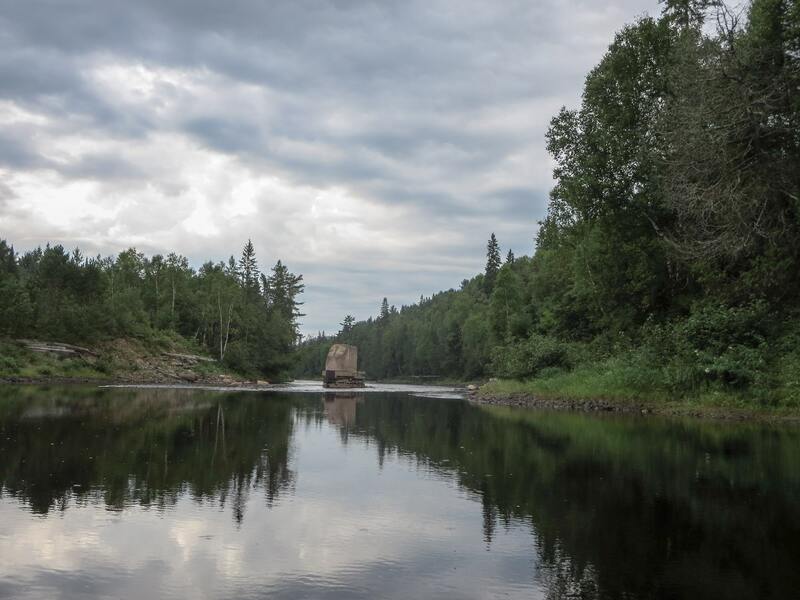 Four kilometers down from the remains of the bridge across the river we came to the day’s one portage, a 250-meter carry on river right around Chute Au Diable. 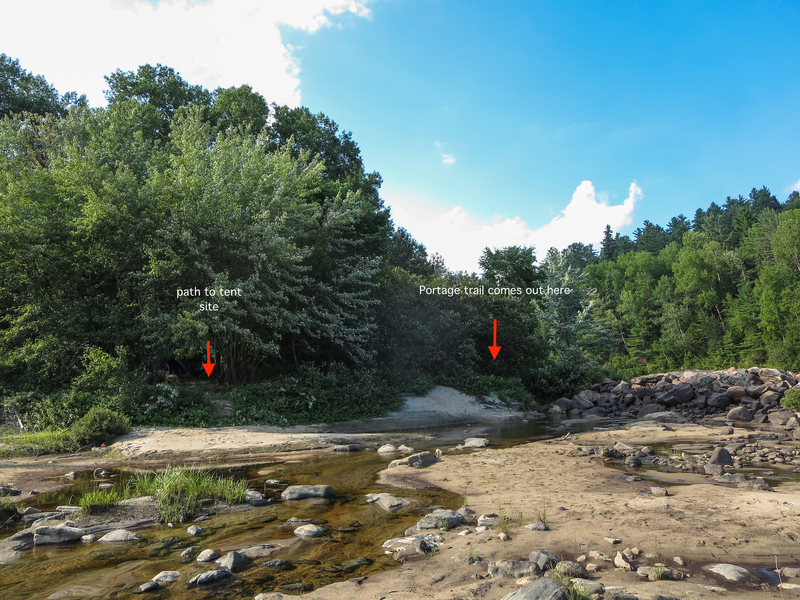 The photo above shows the rapids from the top with its CIII rapids leading to a chute at the end. 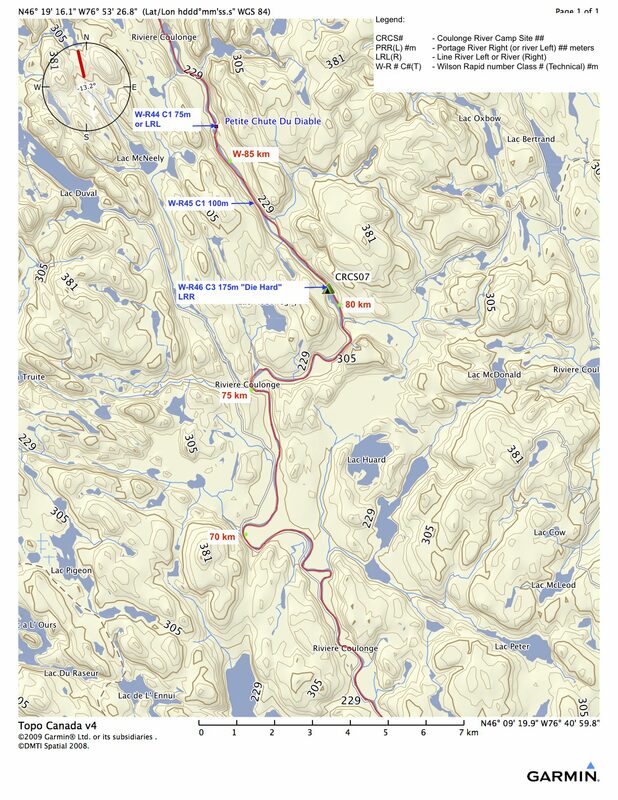 The portage trail ends up just around the corner from the falls themselves. Across the river, we saw what looks to be a new cottage. We paddled back to the falls to get a better looking then continued downriver. 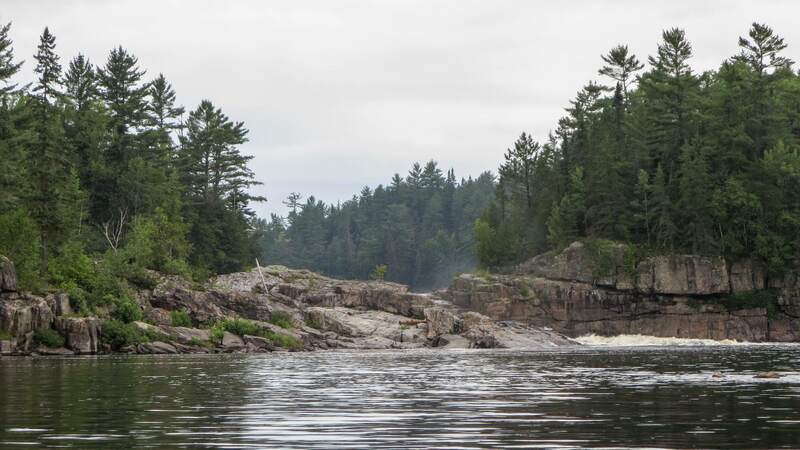 Given the scarcity of rock on the river banks – except for the occasional rapids/falls sections – we had to paddle up to the chunk of rock on river left. Max had to chuckle as my brains and my eyes switched into “pictograph hunting” mode, sucked in by some red lichen that formed what looked like paintings. 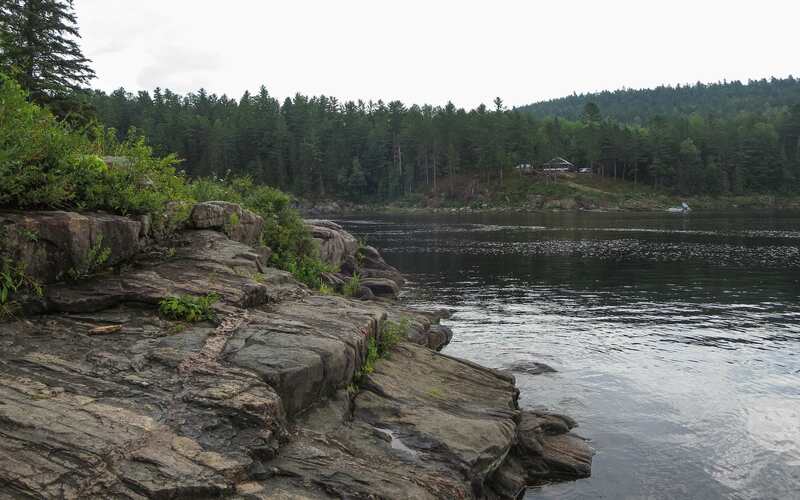 Other than the Oiseau Rock site on the Ottawa River, it is noteworthy how few pictograph sites exist on the Quebec side of the Algonquin world. One could argue that the great period of rock painting in the Anishinaabe world only came after the almost-annihilation of the Ottawa Valley Algonquins by the Iroquois and by the diseases introduced by the Europeans from 1600 onwards. 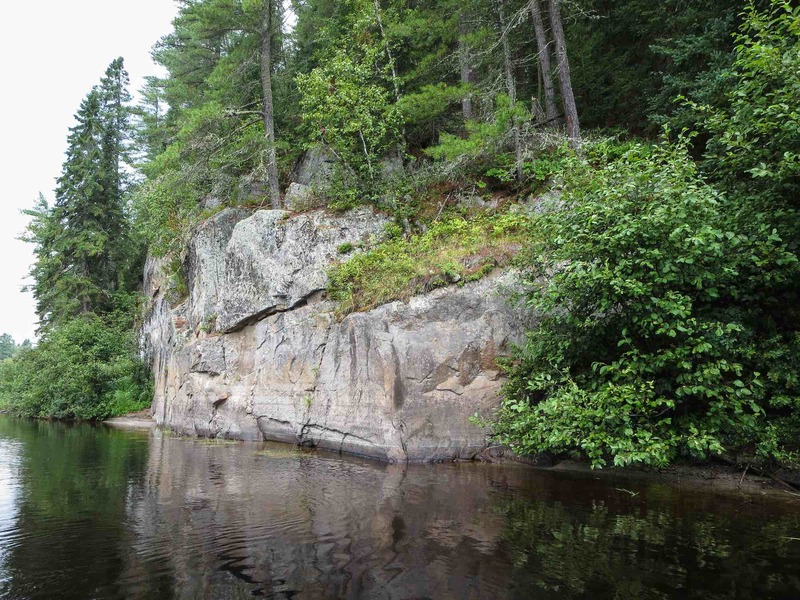 However, the existence of the Peterborough Petroglyphs and the pictographs of Mazinaw Rock, both of which are older than the Ojibwe paintings of northwestern Ontario, would seem to contradict that notion. 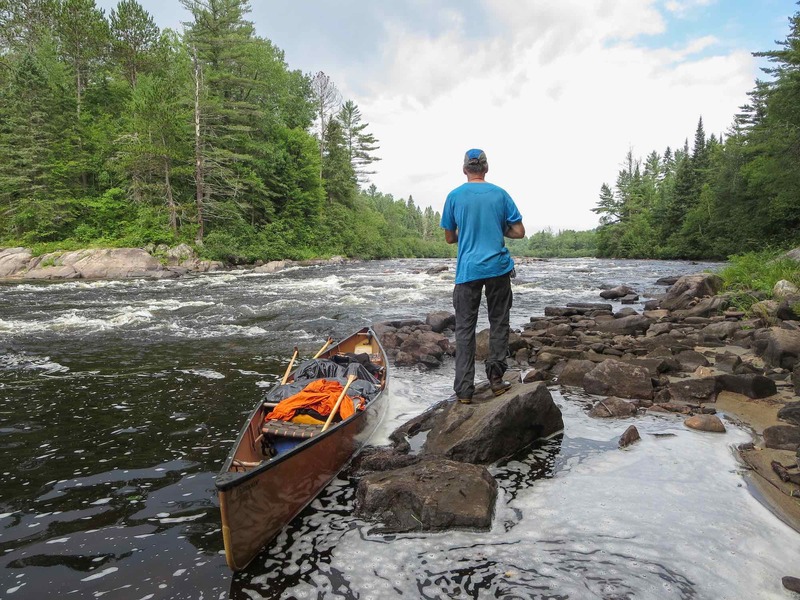 When we came to Petite Chute Du Diable (R44) we lined through the very bouldery river left, opting to spare our kevlar/carbon fiber boat of yet more scrapes and dings. Here is a shot of Max looking back at the top of the rapids. 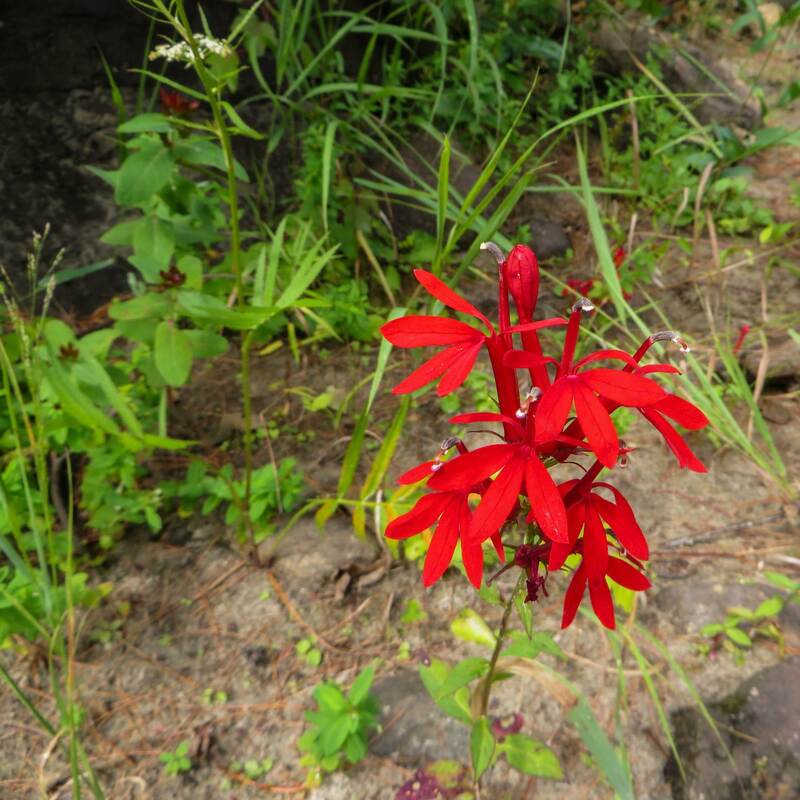 Just after our little living job we spotted some bright red flowers on the right shore and went over to check them out. It proved to be an agreeably shady spot to stop for lunch so out came the Helinox chairs and the water filter and the butane stove. We didn’t know it at the time but we’d only end up paddling another hour after lunch before calling it a day. The reason? 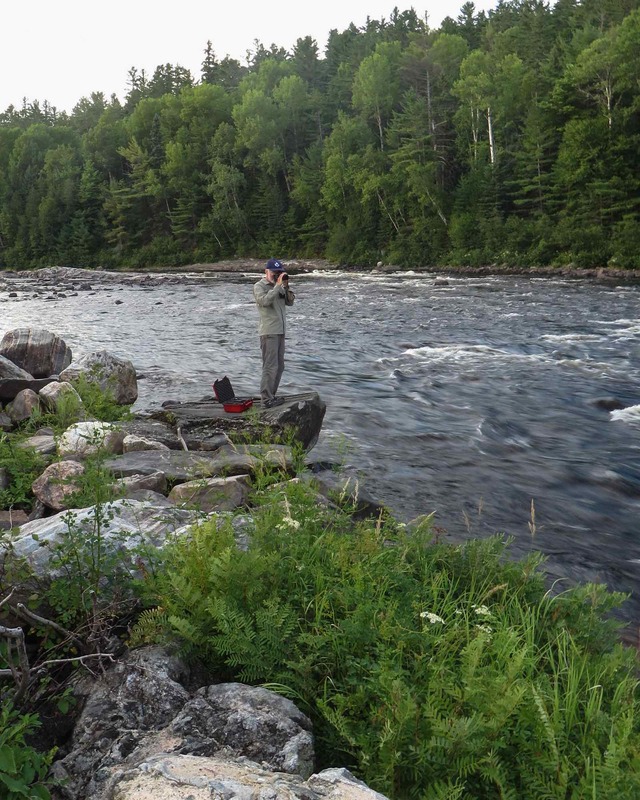 We found – that is, created – a campsite at Die Hard Rapids that had more of what we like. 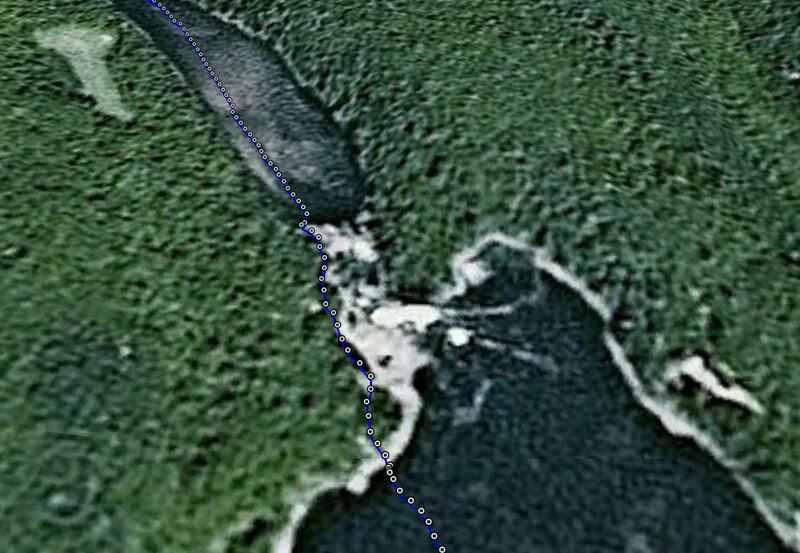 Before that, we paddled by the sandbar site at Km 83 as shown in the pic below. 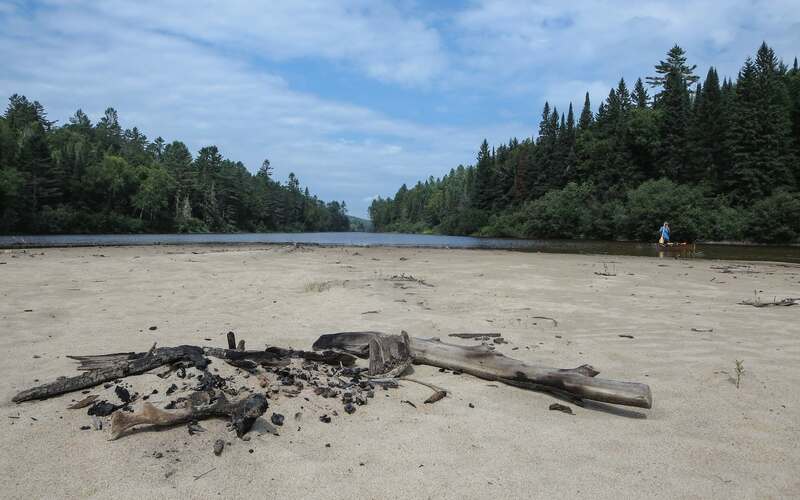 Again we figured that the actual site must be in the bush behind the sandbar – and again, we came up empty in our search. This would be the last time we would bother! We moved on to “Die Hard” Rapids, lining and running the various bits mostly on river right or straight down the middle. There was some scraping and bumping involved in our less-than-elegant trip through the Die Hard boulder garden. 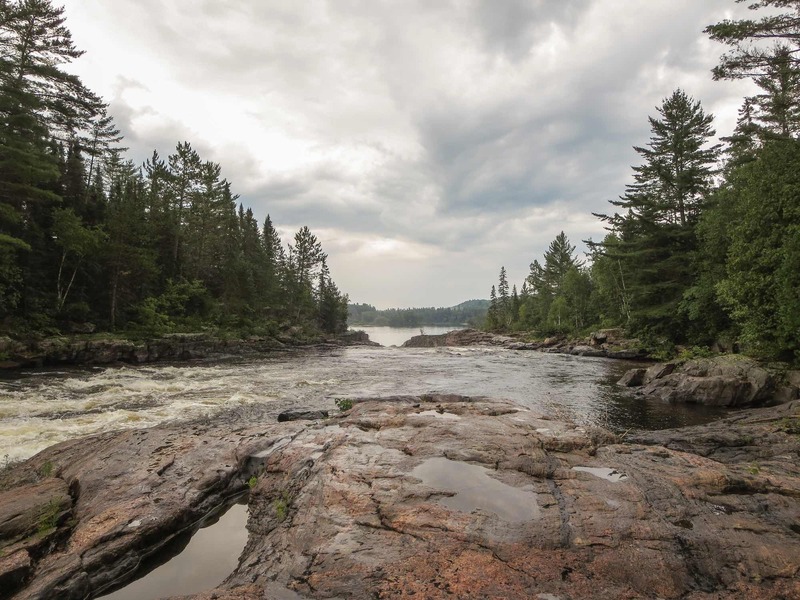 Later on that afternoon we found the portage trail around the entire set of rapids on river right. After we got to the bottom of the rapids we decided that this would be where we would stop for the day. The only problem was there was no obvious campsite. 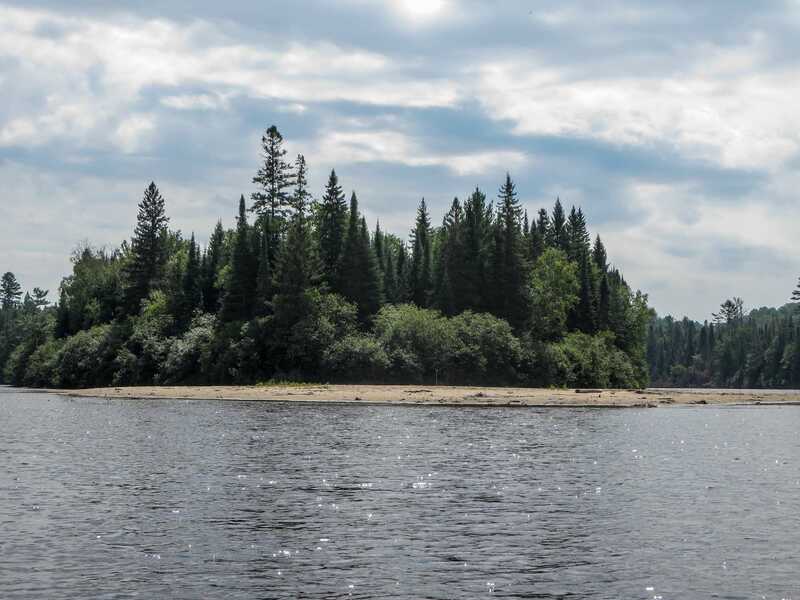 We were in the small bay on river right and looking back upriver to the scene you see in the pic below. 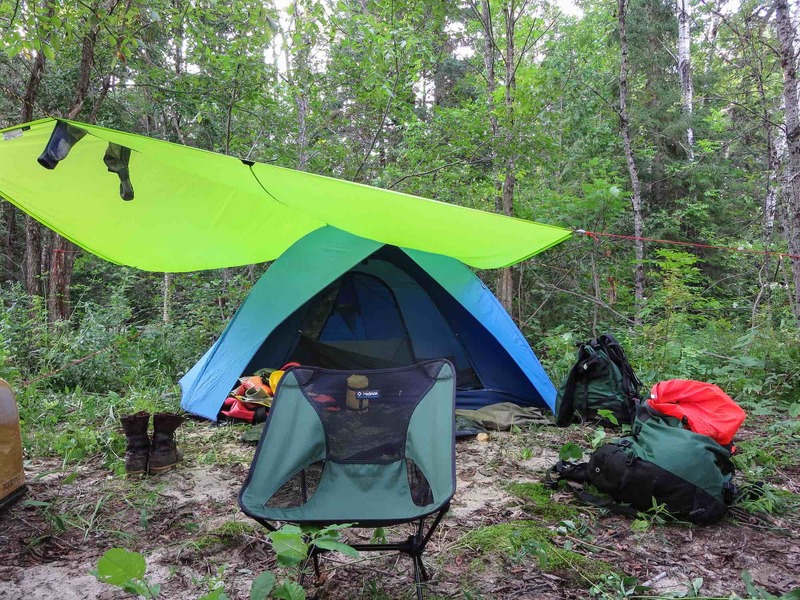 We ended up creating a serviceable tent site tucked in the bush and then stumbled upon the portage trail as we scouted the immediate area. That evening we walked the portage and cleared away most of the deadfall and debris. We also put up some prospectors’ tape at the start and end of the trail. 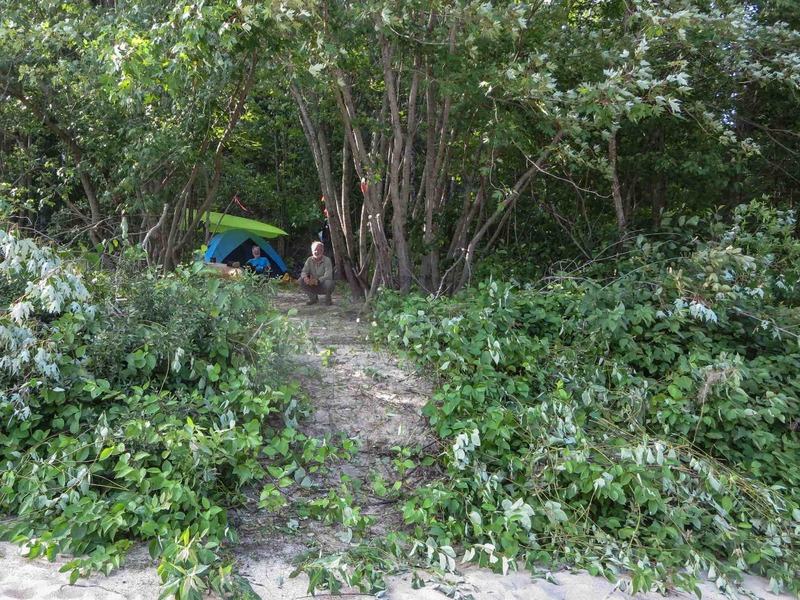 Given the previous night’s location in a parking lot at the end of a side trail that we shared with a pick-up truck, we had decided not to pass up the chance to camp in a spot more closely resembling a wilderness tent site! Ending the day at 1 is not our usual – but given the scarcity of sites, we realized that pushing on might lead to a repeat of the night before. A good call too as we would paddle twenty kilometers the next day and not see anything as good as our tent spot at the bottom of Die Hard! 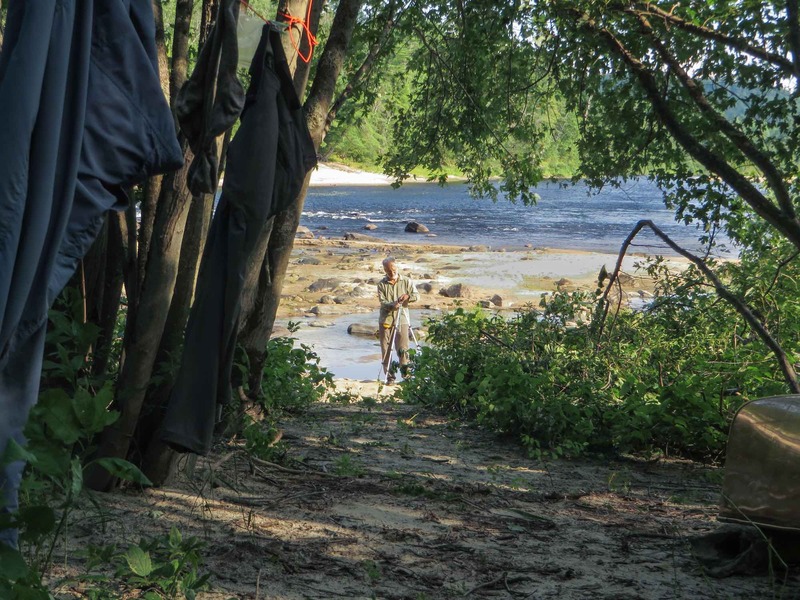 So – we spent about fifteen minutes to create a campsite – the biggest task being to cut a path from the sand beach to the actual tent site nestled in a stand of birches and pines a few feet in. One quality of a better campsite is the opportunity it gives you to ramble around the neighbourhood a bit. 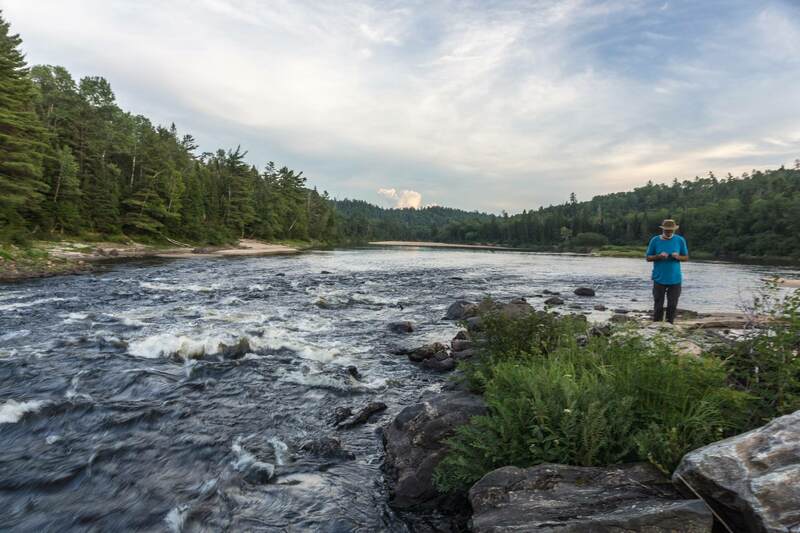 We walked the portage trail and up along the shore for a couple of hours, pointing our cameras in various directions and enjoying the views. 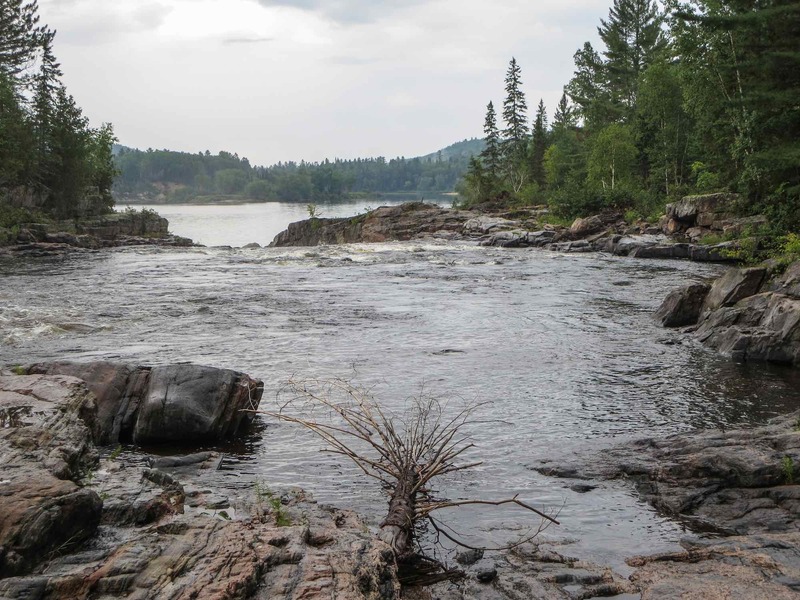 The next day would provide us with even better photo opportunities as we got to know our Rapids Enragés tent site.